The 30,000 spectators that filled the projection halls during the second edition of the Dominican Republic Global Film Festival voted, for the first time, for their preferred films during all the screenings that took place in the five cities where the Festival was celebrated. “Even though our Festival does not award prizes, we have wanted for our audience members to vote for their favorite productions,” explained General Director Natasha Despotovic. Iron Road, presented within the category, “Stories of Migration,” is the history of forbidden love, which takes places during the construction of the transcontinental railroad in Canada in 1880. Emmanuel Jal: War Child, which formed part of the category, “The Power of Music,” transports us to a camp for Sudanese war refugees in Ethiopia, where Emmanuel Jal, who has since become a spokesperson for child victims of war, becomes part of the Sudanese People’s Liberation Army. After almost five years, he and his friends leave the army, embarking on the terrifying journey, during which few survived. During the days that the Festival was celebrated – November 19 – 23 – we had the honor of having Emmanuel Jal with us as one of our special invited guests. He had fascinating and moving encounters with many of the audience members, during which he explained how he went from being a war child in Sudan to becoming a hip-hop artist that spreads messages of peace and reconciliation throughout the world. During these days, Jal carried out an Emma Academy Project campaign, which seeks to construct a school in his native homeland to honor Emma McCune, the women that helped Emmanuel escape from war. Representing the film Iron Road, we were pleased to have with us producer Anne Tait and actress Charlotte Sullivan, both of whom participated in different panels and workshops in addition to the grand screening of the film at the National Theater in Santo Domingo, attended by hundreds of members of the Chinese community in the Dominican Republic. Under the theme, Global Issues, Personal Stories, the Festival – an initiative of Global Foundation for Democracy and Development (GFDD) and Fundación Global Democracia y Desarrollo (FUNGLODE) – brings the best of international cinema to the Dominican Republic, offering opportunities for learning, professional development and the creation professional networks. 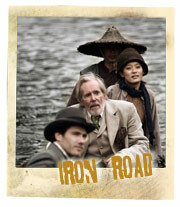 To see the synopsis of Iron Road, technical information about the film and the biography of the director, click here. 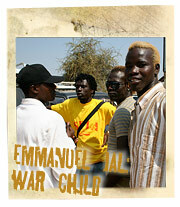 To see the synopsis of Emmanuel Jal: War Child, technical information about the film and the biography of the director, click here.